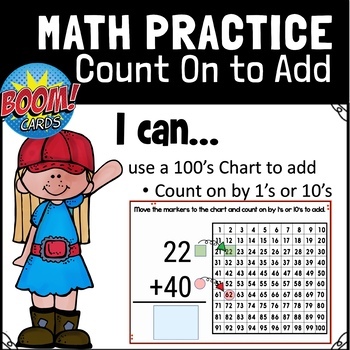 A hundreds chart is a great tool that can be used to show students "why addition works". It allows students to follow along and see how the numbers grow as they apply the counting on strategy. 1. Students move markers to the hundreds chart. 2. The green box represents the 1st number. 3. The red box represents the second number. 4. Students type in the answer.